This content is for NFL Roto Deluxe (Monthly), NFL Roto Deluxe (Season), NFL DFS Premium (Monthly), NFL DFS Premium (Season) and 7 Day Free Preview (One-Time Only) members only. If you are currently a subscriber, please click this button to Log In. Not a subscriber? We offer a free 7-day trial as well as affordable monthly and season-long for the season-long and DFS player. 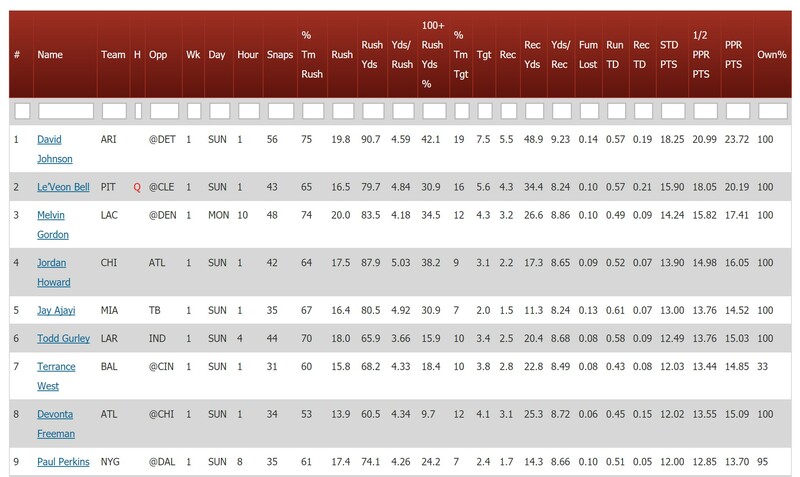 See below to learn more about our tools and/or visit our Subscriptions page to learn why you should subscribe to Razzball for fantasy football projections. Team Stacks – Like a certain team(s) for this week’s games? 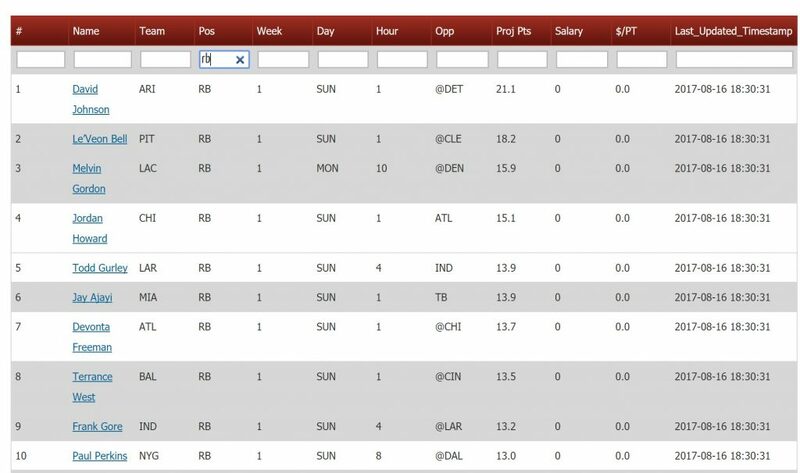 Create multiple lineups around any team or let the Optimizer select the most optimal stack for you. Player Stacks – Like a certain player(s)? Create lineups around 1 or more players. Optimizer will select the optimal combinations according to your settings. Projected points, salaries, and $/PT for DraftKings, FanDuel, and Yahoo DFS. Up on Tuesday morning. Updated at least once a day throughout week and every 5 minutes during the windows before lineup lock. Projections and rankings for this week’s games for QB, RB, WR, TE, FLEX, K, IDP (individual players), and Team Defense based on our proprietary data model. Make roster decisions from a multi-week perspective. Displays actual ranks for past weeks and projected ranks for future weeks. We project rest of season stats for QB, RB, WR, TE, K, IDP (individual defensive players), and Team Defense based on the actual games on the schedule. 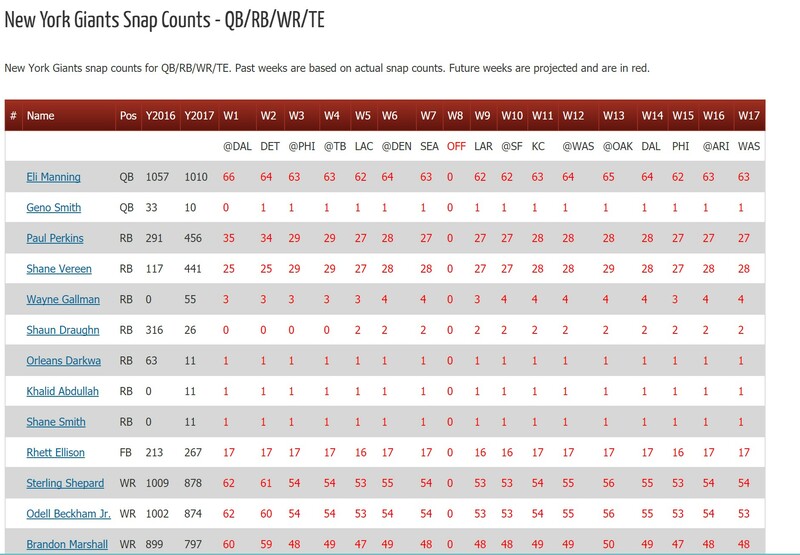 A smorgasbord of offensive and defensive stats and projections for each team including a detailed injury report, this week’s projections, season to date stats, rest of season stats, team defense, and a 17 week view on each player’s positional ranking and team distributions of snap counts, rushes, and targets. 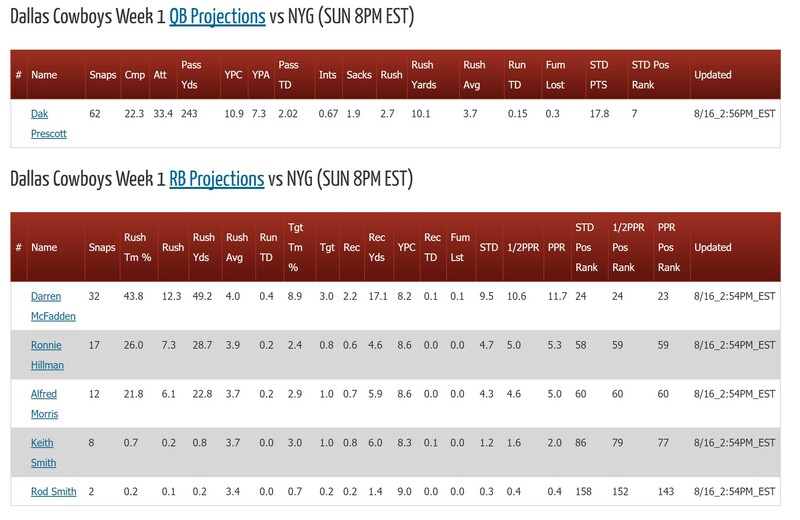 For 17 week views, we show actual data for past weeks and projected data for future weeks. Updated daily (except for injury report which is hourly). For NFL Odds, please see Vegas Odds. Also check out this Game Simulator. Interested in a free trial? Visit our Subscriptions page for more details.